Jesus Was A Threenager, Too! 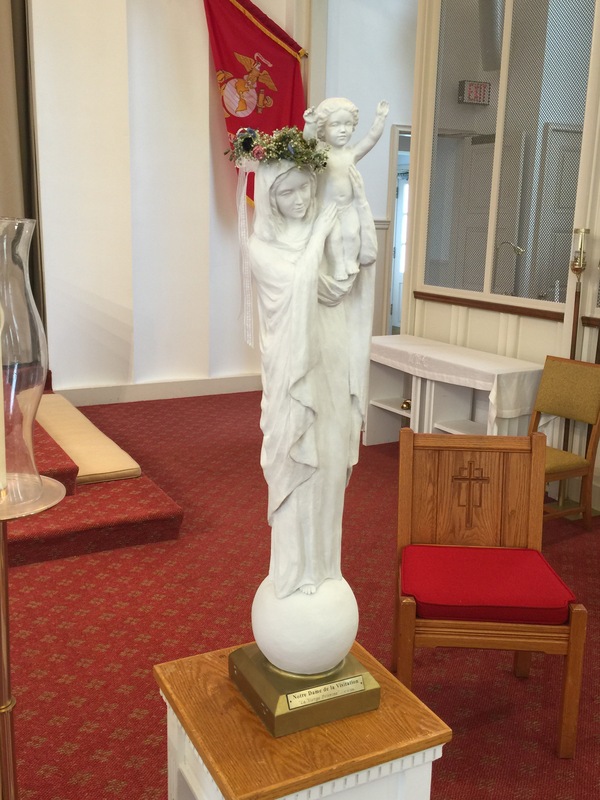 This past Mothers’ Day, I was sitting in church, finishing the hymn we’d sung while having children adorn the statue of Mary with her fresh flower crown. I was also simultaneously corralling a squirly, squirmy threenager, who had, on the way into church, been informed by his dad the threenager forfeited all television and iPad usage for the day. Needless to say, I had difficulty juggling the threenager and my prayers, and felt a little bummed I didn’t get to finish the hymn, since it is my favorite (“Hail Mary, Gentle Woman” – check out Brianna Parish’s rendition on iTunes). At one point, I glanced up from our seats in the back of the church, exasperated. Through all the people in front of us, I somehow had a perfect seat to see the statue of Mary holding toddler Jesus. This was the inspiration for this post, even though the picture was taken a week and a half after Mothers’ Day. At that moment, I realized, although Jesus was fully Divine, He was also fully human. Which meant, Jesus was a threenager once, too! Imagine how giddy I felt when that realization struck! The canonical gospels (those found in the Bible) don’t give much insight into Jesus’ childhood. We know when he was an older child, He decided to spend a little extra time in the Temple, causing Mary and his foster father, Joseph (patron saint of foster parents) to worry. But, aside from that, we don’t know what Jesus was like as a child! Yes, He was fully Divine. But, we are also taught to believe He was also fully human. And, human babies cry, human toddlers and preschoolers have to learn how to listen and obey their parents, and human children have to learn to manage their anger and emotions. Before He learned His Divinity, how did Jesus learn His human characteristics? Furthermore, what was it like as a parent of the Divine, having to teach those lessons of a parent? I walked away from Mothers’ Day completely confident that Mary understands the plight of every parent of a small child. She gets it. When I am getting frustrated with small child antics, she gets me. And, I don’t envy her job one bit, knowing she most likely had to battle the same battles, with full knowledge that she was disciplining God Himself. Talk about intimidating! Yet, all the more reason to look to Mary – if she could parent God, I think I can handle a squirly, squirmy threenager! Posted on May 27, 2016 May 24, 2016 by Anni HarryPosted in Adventures in Parenting, FaithTagged catholic, Catholicism, christian, Divine, Divinity, Faith, Family, God, Human, Mary, motherhood, Parenting, Prayer, Threenager. Somehow I find it hilarious to imagine Jesus to stop wetting His pants! Of go back and brush your teeth right! Similarly, stop eating with your mouth open. I wonder how she handled telling God to knock it off! Haha! Exactly! If I’m ever allowed to ask those questions, I look forward to the answers!